Yanis Varoufakis has said that he does not intend to back down from his rather high “red lines”. European leaders, and especially German finance minister Wolfgang Schäuble, are currently exploring just how true that is. 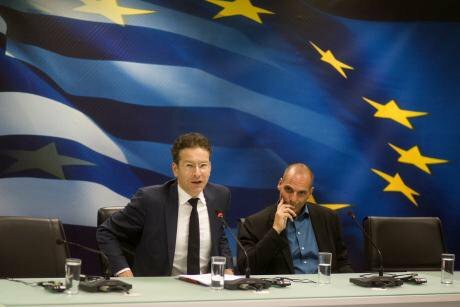 Yanis Varoufakis with his Dutch counterpart Jeroen Dijsselbloem. Demotix/Angeliki Panagiotou. All rights reserved. Yanis Varoufakis, Greek finance minister, is the front-runner in the Greek negotiation with the European institutions to alleviate Greek debt and loosen austerity measures. He is clever and seems eager to answer all questions and concerns. At the same time, he is quite defensive and reluctant to retreat from any of his positions. In his NY Times opinion article on the February 16, Yanis Varoufakis explicitly said that he does not intend to back down from his rather high “red lines”. European leaders, and especially German finance minister Wolfgang Schäuble, are currently exploring just how true that is. A “red line” is obviously a point of no retreat for every negotiator. Anyone who is acquainted with negotiation analysis knows that a red line is de facto set by the Best Alternative To a Negotiated Agreement (otherwise known as BATNA). People may set red lines as high as they wish, but they will be forced to resort to their best alternative immediately after they fail to reach agreement. Imagine, for example, that you are negotiating the sale of your car. What is the lowest price you will accept? Obviously, you should never accept a price lower than the best other offer you might have (which is your BATNA). On the other hand, you should not reject an arrangement that is much better than your BATNA, because your BATNA is exactly what you will get if you reject the arrangement. In other words, the BATNA represents the absolute lowest price you should be willing to accept. Rational negotiators use their BATNAs as red lines, as points of no retreat. If they set higher red lines, they could walk away from profitable arrangements and eventually experience much worse outcomes. For Greece, Grexit is probably the best alternative in the case of no agreement with its European counterparts (since appealing to Russia or China are generally considered nightmare scenarios). No red line should be above it. Still, Dr. Varoufakis has set red lines that outline a much better living standard for Greeks when compared to the living standard under the Grexit scenario. He seems ready to reject European help, unless it is offered with much more lenient conditions. Why would he risk a solution that is so much better than his BATNA? In his NY Times article, he says that his red lines originate from what is right, irrespective of consequences, consistent with the teachings of Immanuel Kant. In other words, Yanis Varoufakis argues in favor of positions that are based on moral principles. The principles themselves lay out the red lines, not Greek interests or the so-called BATNA. However, Dr. Varoufakis gets his Kantian ethical argument wrong. In his conclusion, he suggests putting the interests of European citizens center-stage in order to uphold Kantian ethical principles. This argument is entirely correct for utilitarian economics, but completely wrong for Kantian ethics. Immanuel Kant famously argued that ethics should be free of interests and should only be subject to the demands of reason. He would completely factor out Greek or European interests or any of the win-win solutions that have been offered. If anything, he would stress the duty arising from prior commitments of Greece toward its European counterparts. In fact, the argument "There are rules that should be followed", which many European leaders use, is based in exactly this sort of Kantian reasoning. If it is Greek or European interests he wants to serve, Dr. Varoufakis should set red lines on par with the prospective dire situation following a possible Grexit. If it is Kantian duties he aims to uphold, his red lines should include the obligations that the previous Greek governments have undertaken. In reality, Yanis Varoufakis does neither. Instead, he commits to red lines that are set by the internal political agenda in Greece and fails to provide consistent, credible justification. Without credibility, the presentation of his red lines has simply been proven useless. It was inevitable that European leaders would eventually challenge these red lines. Greece will be retreating to new red lines until European leaders decide that they have gone far enough.